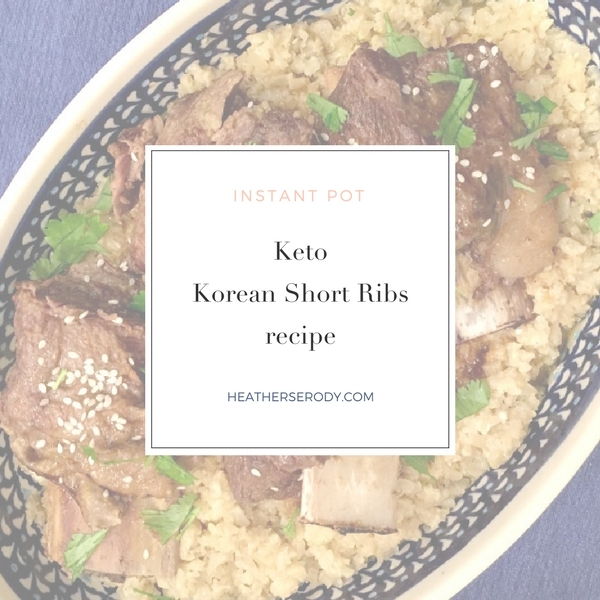 It turns out that you CAN replicate the yummy umami and slightly sweet flavor of traditional Korean Short Ribs without the carbs or time spent in the kitchen. What can I say, I'm a stubborn woman. My secret weapon is the Instant Pot, whose high-pressure magic infuses the ribs with tangy & savory Asian flavor in about an hour with hardly any added carbs. Don't forget to garnish with fresh cilantro – it makes the ribs sing with bright flavor! These Korean Short Ribs are Keto-approved to keep your insulin response low and hormones happy. Serve with sticky cauliflower rice for a complete keto meal. 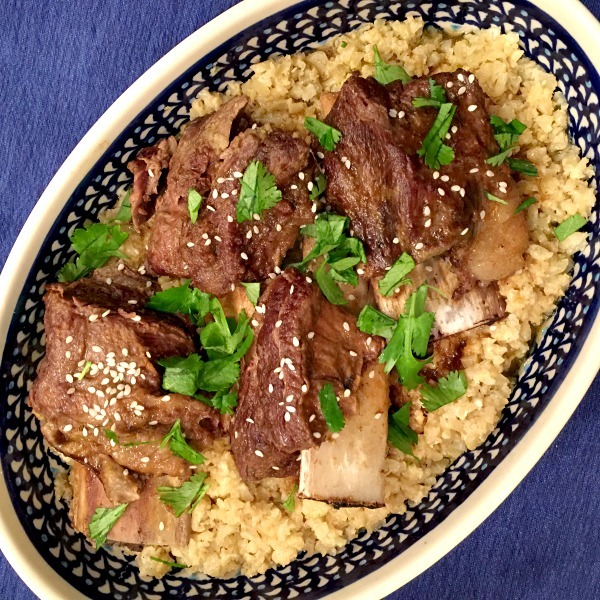 It turns out that you can replicate the yummy umami and slightly sweet flavor of traditional Korean Short Ribs without the carbs or time spent in the kitchen. The secret weapon is the Instant Pot, whose high-pressure magic infuses the ribs with tangy & savory Asian flavor without any of the added carbs. Don't forget to garnish with fresh cilantro - it makes the ribs sing with bright flavor! Blend all of the sauce ingredients in a high-powered blender until smooth. Set aside. Turn on Instant Pot to sauté & add oil. Sprinkle ribs with sea salt & pepper. Add 1/2 the ribs. Lightly brown on all sides. Remove ribs and set aside on a plate, then brown remaining ribs. Turn off sauté function on Instant Pot, and add all ribs back into the pot, arranging them in in a single layer. Pour sauce over top. Make sure silicone ring on the lid is in place and set pressure release valve to closed. Close lid. Choose beef/stew setting and increase the time to 50 minutes cooking time. After cooking is done, allow pressure to come down on its own before opening (about 15 minutes). After 15 minutes, open the release valve to release any remaining pressure and open lid. Remove ribs to a covered serving platter to keep warm. Turn Instant Pot on using sauté button and allow the sauce to boil for about 15 minutes in order to condense and thicken the sauce. In the meantime, you can prepare your cauliflower rice. After sauce is condensed, pour the sauce into a fat skimmer to remove the fat. Serve ribs on a bed of hot cauliflower rice, spoon sauce over top and garnish with sesame seeds and fresh cilantro. Use a large heavy bottomed pot or dutch oven with a tight-fitting lid to brown the ribs. To cook ribs, simmer in the same pot with the lid on for approximately 2.5 hours, checking regularly for desired meat tenderness. This post contains affiliate links. Thank you for supporting this site by using them to shop! The sauce was good but the meat fell apart like it was shredded. All the meat came off the bones Looked at some other recipes afterwards and they only cook for 5-6 minutes, not 50. Thankfully the recipe is back thanks to some help from the folks at Cookbook. Veronica – Thanks so much for bringing this to my attention. I use a plugin for the recipes and it looks like it isn’t functioning right. 🙁 I’ve requested some help from the folks over at Cookbook to help me restore the original ribs recipe. Hopefully, we will have a fix soon and the correct recipe will show. Sorry for the inconvenience and thanks for your patience.